Vatican City, Jul 17, 2014 / 07:52 am (CNA/EWTN News).- The Vatican confirmed today that Pope Francis will travel twice to the city where an evangelical pastor from Buenos Aires is living, in order to meet with local Catholics in addition to visiting his old friend. In a statement released July 17, the Vatican announced that Pope Francis has added a day onto his already-planned trip to the city of Caserta in the Campania region of Italy to visit Pastor Giovanni Traettino, who is an old friend from his time in Buenos Aires. The pontiff will travel to Caserta on the afternoon of July 26, where he has accepted the invitation of the diocese’s bishop, Giovanni D'Avise. Upon his arrival, the Pope will meet with local Catholics and celebrate Mass for the feast of St. Ann, most likely in the park of the Royal Palace of Caserta. He will then make the trip back to Rome that evening so that he can recite the Angelus prayer with faithful in St. Peter’s Square on Sunday, as he does every week. The following day, July 28, the Bishop of Rome will return to Caserta to pay a private visit to his longtime friend, Evangelical pastor Giovanni Traettino, and his community. 1) What is the source of the claim? Fr. Kevin Devine, an American priest who has said English-language Masses in Medjugorje for a number of years made the claim after such a Mass on June 25th. 2) Where did he get his information? From Fr. Miljenko Steko, the Franciscan provincial of the territory in which Medjugorje is located. 3) What did he say? “Recently, the Provincial of the Franciscans here in Medjugorje (Fr. Miljenko Steko, ed.) was in Rome for a meeting of Superiors of religious communities. In the course of that stay in Rome, he along with so many others had a few moments personally with Pope Francis” Fr. Kevin Devine began his account of Fr. Miljenko Steko’s meeting with the Pope. “Pope Francis was standing there, welcoming them, and the Provincial said ”I am the Provincial of the area in which Medjugorje is located.” And the Holy Father’s response was: ”Pray that I have made the right decision”. And we are happy for that and we continue to pray that his decision will be announced soon, and of course we are sure that his discernment and his decision-making is guided especially by the Holy Spirit. But keep those prayers going” Fr. Kevin Devine continued. 4) How reliable is this report? It is difficult to say. There have been reports before, including before Pope Benedict resigned, that a decision had been made, but thus far no decision has been announced. It is worth noting that the information is being reported third-hand. Rather than a statement from Pope Francis, we have it at two removes, and that is reason for caution. On the other hand, the request for prayer is characteristic of Pope Francis. It could be true. We’ll have to wait and see. (Vatican Radio) Pope Francis has sent a Message to the Argentine Israelite Mutual Association (AMIA) to mark the twentieth anniversary of the bombing of the AMIA centre in Buenos Aires, which killed eighty-five people and wounded hundreds of others. The incident remains the worst terrorist attack in Argentina's history. Below, please find the full text of Pope Francis' Message in English. (Vatican Radio) Pope Francis has written a personal message to the parish priest of Gaza, Father Jorge Hermandez, a fellow Argentinian, saying he is keeping the territory’s Christian community in his prayers. In his message the Pope offered words of comfort and assured them he was praying for them all. "The Holy Father, Pope Francis has learned with dismay of the tragedy of the Malaysian Airlines aircraft downed in east Ukraine, a region marked by high tensions. He raises prayers for the numerous victims of the incident and for their relatives, and renews his heartfelt appeal to all parties in the conflict to seek peace and solutions through dialogue, in order to avoid further loss of innocent human lives." (Vatican Radio) Pope Francis has telephoned the presidents of Israel and Palestine. A Communiqué from the Press Office of the Holy See explains that the purpose of the calls was to voice concern over the violent conflict that has been underway for more than a week between Israeli forces and Hamas militants in Gaza. Below, please find the Vatican Information Service’s English translation of the Communiqué. Following last Sunday’s heartfelt appeal for continued prayer for peace in the Holy Land, this morning the Holy Father Francis personally telephoned President Shimon Peres of Israel and President Mahmoud Abbas of Palestine to share his very serious concerns regarding the current situation of conflict involving in particular the Gaza Strip which, in a climate of growing hostility, hatred and suffering for the two populations, is claiming many victims and giving rise to a serious humanitarian emergency. In a phone call to President Shimon Peres, Pope Francis expressed his concern for the lives of innocent civilians in the ongoing conflict in Israel and the Gaza Strip. Peres assured the pope that Israel is doing everything it can to find a peaceful solution and that terrorist entities and extremists bear responsibility for the current suffering in Gaza. Peres thanked Pope Francis for his involvement and concern, saying, "We are currently under fire from rocket attacks by a terrorist group in Gaza." "The residents of Gaza are not our enemies and we don't want to see them suffer. Gazans themselves did not choose the situations they are currently in," Peres told the Pope adding that, "The purpose of our work is to put an end to the tactics which terrorists have developed - rockets in the sky and tunnels under the ground. In recent days Israel has discovered two underground tunnels which allowed terrorists to reach into the heart of towns and kill civilians indiscriminately." "Luckily we prevented murder," said Peres. (Vatican Radio) The Pontifical Council for Interreligious Dialogue has sent a Message to Muslims to mark the conclusion of the month of Ramadan. The theme of the Message is: Towards a Genuine Fraternity between Muslims and Christians. “Our contemporary world faces grave challenges which call for solidarity on the part of all people of good will,” writes the Council’s President, Cardinal Jean-Louis Tauran, noting threats to the environment, the crisis of the global economy and high levels of unemployment – particularly youth unemployment – as some of those challenges. A bitter clash between the Catholic Church and the Lutherans in Germany is threatening the planned joint celebration of the 500th anniversary of the Reformation in 2017. The row revolves around the failure of the German Protestant Church (EKD) to mention the historic 1999 Joint Declaration on the Doctrine of Justification, in its “position paper” on the ­theological foundation of the Reformation, which was published in May. The 1999 declaration is seen as a milestone in Catholic-Lutheran relations, and the omission has seriously endangered ecumenical dialogue. The omission was criticised by the former president of the Pontifical Council for Promoting Christian Unity, Cardinal Walter Kasper, last month (see The Church in the World, 21 June). (Vatican Radio) The last Christian families still present in Mosul are leaving the city and are heading towards Iraqi Kurdistan. The exodus was caused by the proclamation on Thursday by the self-proclaimed Islamic Caliphate that Christians must pay a special tax or be killed. Islamists have for the past two days been marking the doors of homes belonging to Christians and Shia Muslims living in the city. “For the first time in the history of Iraq, Mosul is now empty of Christians,” said Chaldean Patriarch Louis Sako in an interview with the AFP news agency. The situation Christians are facing in Iraq is becoming increasingly dramatic. ISIS extremists have burned down the Syro-Catholic bishopric in Mosul, the Patriarch of the Syro-Catholic Church, Ignace Joseph III Younan told Vatican Radio in a statement condemning the act. This morning the patriarch met with the Secretary for Relations with States, Archbishop Dominique Mamberti, in the Vatican. Pope Francis is following the developments in Iraq closely and with great concern as Christians are struggling to survive. After almost two thousand years, there are now no Christians left in Mosul. Speaking after the Angelus in St. Peter’s Square, the Pope turned his thoughts to those Christians who are now persecuted in the lands they have lived since the beginning of Christianity, offering - he said - a precious contribution to the good of society. At 12pm today, Pope Francis appeared at the window of the study in the Apostolic Palace to pray the Angelus with faithful and pilgrims gathered in St. Peter's Square. This Sunday's liturgy offers some evangelical parables, short stories that Jesus used to proclaim the Kingdom of heaven to the crowds. Among those in the Gospel reading of today, one that is rather complex, is Jesus' explanation to his disciples of the good wheat and the tares, which addresses the problem of evil in the world and highlights the patience of God (cf. Mt 13,24-30.36-43). The scene takes place in a field where the master sows the wheat. But one night the enemy comes and sows tares, a term that in Hebrew derives from the same word as "Satan" and refers to the concept of division. The servants would straight away cut away the bad weeds, but the master stops them for this reason: "Lest while you gather up the tares, you root up also the wheat with them. (Mt 13:29)”. The Archbishop of Canterbury has written to reassure other Churches that the Church of England is continuing on its "quest" for unity after concern and dismay was expressed about the decision to ordain women bishops. Archbishop Justin Welby said Churches "need each other". He said that the vote at General Synod last week was an "occasion of deep rejoicing for many", although "a source of disappointment and concern" for others. He acknowledged that while some Anglican Churches would welcome the result of the vote, “we are also aware that our other ecumenical partners may find this a further difficulty on the journey towards full communion" and that dialogue now faced "new challenges". But Welby emphasised that with “so much troubling our world today”, common witness to the Gospel was of greater importance than ever. Catholic Archbishop Bernard Longley, chairman of the international Anglican-Catholic dialogue body Arcic, said last week that the decision "sadly places a further obstacle" on the path to unity, but added that the bishops were still committed to ecumenical dialogue. The Russian Orthodox Church’s department for external relations said it was "alarmed and disappointed" by the vote. "The decision to ordain women, which the Church of England took in 1992, damaged the relationships between our Churches, and the introduction of female bishops has eliminated even a theoretical possibility for the Orthodox to recognise the existence of apostolic succession in the Anglican hierarchy." The "religious cleansing" of Christians and other religious minorities from the Iraqi city of Mosul has brought widespread condemnation, but so far mostly silence from Western political leaders. For the first time in 1,800 years, the city is devoid of Christians after the last families fled the city on Saturday ahead of an ultimatum by occupying Islamist militants, ISIS. Many of them were stripped of their possessions as they fled to seek refuge in Kurdistan. Vatican Radio reports that people of other faiths, including Shi'ites, Yazidis and Shabaks, have also fled from the ISIS militants who have destroyed churches, mosques and shrines and seized property in what amounts to a “cleansing” of religious minorities. Leading a service of solidarity in Baghdad, Chaldean Patriarch Louis Raphaël I Sako said “the heinous crime of the Islamic State was carried out not just against Christians, but against humanity”. In a sign of protest and solidarity with the persecuted, some Christians have been marking themselves with an "N", the first letter of the Arabic word for Christian, "Nasrani" or Nazarene. The Islamic State has been putting an "N" on Christian property marked out for seizure. Baghdad’s auxiliary bishop, Shlemon Warduni, has called for an international response and for foreign leaders to speak out and act. On Sunday, Iraq's prime minister, Nouri al-Maliki, condemned ISIS’ actions, saying their aggression ”reveals beyond any doubt the extremist, criminal and terrorist nature of this group". In New York, the office of UN Secretary-General Ban Ki-Moon issued a statement condemning ISIS attacks on all religions as a crime against humanity, for which those responsible must be held accountable. Ban condemned “in the strongest terms the systematic persecution of minority populations in Iraq by Islamic State [of Iraq and Syria] and associated armed groups,” a U.N. statement said. The U.S. State Department was similarly strong in its condemnation after ISIS issued its ultimatum to Mosul’s Christians to either convert, pay a tax, leave or face imminent execution. “The United States condemns in the strongest terms the systematic persecution of ethnic and religious minorities by the terrorist group [ISIS],” it said in a statement issued Friday. The Vatican has released the program of Pope Francis' visit to the Italian city of Caserta this Saturday. The Pope, who will be visiting over two days 26 and 28 July, split up into private and public events, will be celebrating a public Mass and meeting with diocesan priests on his earlier visit. After a 3 p.m. flight Saturday from the Vatican into the heliport of the Italian Air Force School in the Royal Palace of Caserta, the Pontiff will first visit the Air Force Officer’s Club, where he will meet with diocesan priests at 4.p.m. His next engagement is a Eucharistic celebration, to take place at 6 p.m. in the square adjacent to the Royal Palace. The Holy Father will preside over the public Mass for the feast of St. Ann. Finally, Pope Francis will depart for Rome at 7:30 p.m. and is scheduled to arrive in Vatican City around 8:15 p.m. The private part of the visit will be on Monday when the Pope meets his friend Fr. Giovanni Traettino, who had invited him to visit Caserta. On the Sunday in between, the Vatican confirmed Francis, as usual, will pray the Angelus with the faithful in St. Peter's Square. Last month, when Francis met with a group of evangelical pastors in Rome, it was reported that a pastor friend he “had already known well from his time in Buenos Aires” extended the invitation, to which the Pope agreed. An evangelical pastor who was a close friend of Pope Francis has died from injuries sustained in a motorcycle accident. British-born Tony Palmer, a bishop with the Communion of Evangelical Episcopal Churches, died in hospital in England Monday, hours after undergoing surgery following the accident. In January this year, Pope Francis gave Palmer a message to give to a charismatic conference, hosted by television evangelist Kenneth Copeland. Palmer showed the audience the video message, recorded on his smartphone, in which the Pope spoke encouragingly of ecumenism and unity. The well-received message was viewed by many as a remarkable development, especially as not long ago conservative evangelicals in North America were inclined to view the Catholic Church in highly negative ways. ROME—Bill de Blasio isn't known for being a religious mayor but one of his first stops on his Italian vacation was the Vatican, where he made an in-person request for Pope Francis to visit New York City. 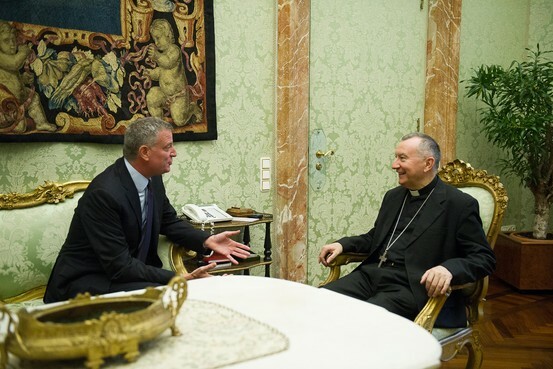 The mayor didn't get a formal response from Vatican Secretary of State Cardinal Pietro Parolin on Monday morning. And Mr. de Blasio, who has no formal religion, said he wasn't going to become a practicing Catholic anytime soon. But the Democrat later spoke at length about his respect for Pope Francis, whose message of inclusion has resonated throughout the world. The Italian-American mayor said he had "a very strong cultural and emotional tie to the church and a deep appreciation for what's good about the church and particularly what's good about this pope." (Vatican Radio) Pope Francis has reassured the Patriarch of the Syriac Catholic Church Ignatius Youssef III Younan that he is following news out of Iraq with concern, particularly the dramatic situation of Christians in Mosul who have been threatened with death and seizure of their homes by Islamic militants demanding they leave or convert to their form of Islamic belief. Christians have lived in Iraq’s second largest city for nearly two thousand years; there are few, if any, left now in Mosul. The Patriarch told the Italian Catholic news agency SIR (Religious Information Service), that Pope Francis called him Sunday 20 July to express his solidarity with Iraqi Christians. During the 9 minute phone call, the Patriarch thanked the Pope and asked him to intensify his efforts to engage world leaders, putting them face to face with the facts on the ground: that in the province of Nineveh a massive religious “cleansing” campaign is underway to rid the region of those who do not share the beliefs of the new occupiers. (Vatican Radio) Pope Francis is marking the upcoming Day for Life in the UK and Ireland with a call to all people of good will to cherish life, particularly the life of society’s most vulnerable. The theme of this year’s Day for Life – celebrated on July 27th - is #livelife Protect and Cherish Life from its beginning to its natural end. It invites young people in particular to get involved in caring for, nurturing and protecting life at every stage and in every condition.